At Mackay Transit Coaches, our team is both proud and passionate about what we do. 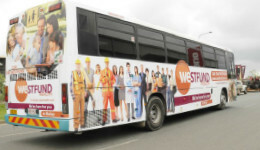 Passenger transport is a vital service that connects people, communities, and places all around Australia. We’re a leading provider of all of the urban, school, and charter travel requirements in the Mackay region and around Queensland. Mackay Transit Coaches is a privately owned business that has provided employment for residents of the region for over twenty years. With a dynamic team environment across all departments, each and every employee plays an active role in creating a positive work environment to drive the business forward into the future. Our employees share and understand the core values and goals of the business as to understand the key role that they hold in the company. As part of our commitment to enhancing these roles and relationships with each and every employee, an ongoing emphasis is placed on training, professional development, and acknowledging a job well done. To become part of the team at Mackay Transit Coaches, please fill out the form below or send us a copy of your resume to jobs@mackaytransit.com.au. If you’re in the area, feel free to come in and meet our friendly team at 12 Titanium Drive, Paget and leave your details with our reception staff.